​​When it is time to give your shower an upgrade, learning how to install shower valves is something good to know. While knowing how to install a new shower valve can be more of an intermediate DIY task, it is one that can save you money. It is also one that can be learned if you follow this step-by-step guide. Before you begin to install the new valve, it is a good idea to unpack your new shower valve and handles. This will let you see all the parts to make sure you have everything you need to complete the installation. It is also important to know-how to tell what shower valve you now have. Here are a few of the common ​valves, and what they primarily do. Spend a few minutes looking at your valve to determine which one you have. This will save you time down the road when removing and installing a new one. 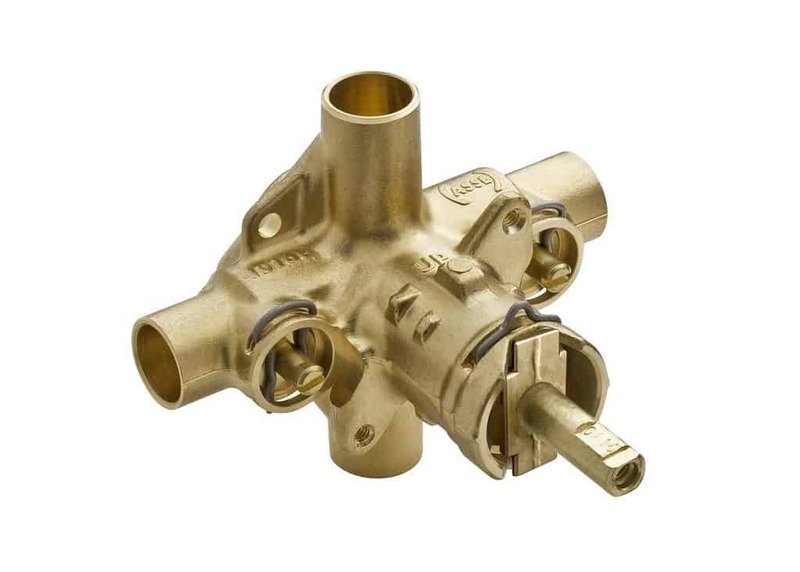 This type of valve is designed to keep water steady at a set temperature. It is as easy as choosing your specific temperature, turning the shower on, and waiting until it heats to the correct temperature. Commonly, this valve comes in a single knob. It is turned to the correct water temperature. It doesn’t use dual shower knobs for hot and cold to try and find the right temperature combination. Learning how to install a shower mixing valve is easier, since it is a single valve. Installing two separate ones that connect and work together will be much trickier, much like two shower heads who share the same lines. If you are installing a new valve in your bathtub/shower combo then you will be learning how to install a shower diverter valve. This is because a shower diverter is one that will allow you to choose if you are sending water to the shower head or changing it to run out of the bath faucet, like a shower panel that has many features. This type of valve is not to be confused with a transfer valve. That one allows you to transfer water from the shower head to an attached handheld shower device. Water is flowing the same way for a transfer valve. In a diverter valve, the water is being cut off to one source and sent in the opposite direction to another source. In the end, whether you're installing a rain shower or handheld, a shower panel or a dual head, adding a shower valve is a key skill to know. We'll walk through that process next. ​Prior to installing your new shower valves, you're going to have to remove the old one first. Here are the steps you need to take before you can move on to installing ​a shower valve. These tools will be what you need to remove and then install a new shower valve. This guide is focused on how to install shower valves when you have copper pipes. Even if you are dealing with a different piping system, you can still follow this guide. It gives a full overview of the steps you will generally follow. The main difference is, you will not be soldering other types of pipes like PVC or plastic ones. They will have either a screw in or a push to snap in the connection. ​Before you can install a new shower valve, you will need to take off the original one. When dealing with water pipes, the first step you should take is to turn off the water. This may seem like a hassle. But, it is much easier to go without water for an hour or two, versus cleaning up water in your shower from behind the wall and all over the floor if things go south. First things first, you need to remove the handle of your shower or faucet. ​Get a gallon-sized, resealable plastic bag ready to place your screws and other parts of the original valve in. While you may end up just throwing it away, this is a good precautionary step. If things don’t work out, you may need to replace your shower valve temporarily. Next, begin to remove the valve handle. Usually there will be a visible or hidden screw. If you don’t see one, look under a cap you can pop off with a utility knife. Use your screw driver or Allen wrench to begin removing the screws. Do this one by one, until you have taken the handle completely off of the wall. ​Once the handle has been removed, you can easily see and get to the screws that are securing the plate. Take out the screws and place them in the same plastic bag as the handle. There will most likely be an adhesive-like caulk behind the plate to seal it. Use your utility knife and carefully run it around the edges of the plate. Once the plate has been lifted, you may see a second plate in the wall. This is a protective plate that is used to help stabilize the valve and hold the pieces steady if you have a thin wall. Remove the protective plate. You may need to cut into the wall to remove this. Make sure you do not make a larger hole than you need. The following step will help you determine how large of a hole to cut in order to reach the pipes. ​When you are replacing your shower valve body, make sure you have an access point for working. You need to clearly see what you are doing. You will also need to be able to reach in and move freely enough to loosen or tighten the new valve. ​Start by making the workspace hole in your tile wall​ so you can easily remove the valve in the final step. The best way to figure out how large of a hole you can make is to take your new shower valve plate cover and trace it against the wall where it will be positioned. From there you can safely cut inside of that marker (trace about 1-1.5 inches away from the outline). You need a platform against the wall for the plate to be adhered to. This cut may be enough for you to reach in to cut the valve out. But, if you are not as familiar with the work involved you will want to go ahead and cut a second access point. The second access point is a rectangular panel that is cut on the opposite side of the wall. It is much easier for you to be able to see the pipes. It will make fitting and attaching the valve a steadier task. Thankfully enough, it isn't this complicated to install a new shower head in the bathroom. ​You will need to cut the original valve out ,since no two valves will be the same. There is no workaround to try and connect a new faucet to an old valve. Due to the limited space you will have, a mini hacksaw is ideal to finish removing a valve. Cut the valve out. Try to leave a good amount of copper pipes for the new valve to be able to reach and connect to. Once the old valve is out, you can get to work installing the shower valves​ for a better showering ​experience. If you are dealing with copper pipes, there will be soldering involved. This can seem like an advanced task if you have never done it before. But, before you pick up that phone and call someone, read over these steps to learn more about how to install shower valves and do this DIY project on your own. Soldering and plastic do not mix and will potentially ruin your valve parts if neglected. Read all your instructions on the valve before you begin to solder it into the pipes. This guide primarily focuses on how to install a shower faucet single handle valve. It will not be specific to your valve. Make sure you are combining the instructions with this simple step-by-step process and the valve’s specific needs. Make sure you leave the shower doors open should a mishap occur. ​Now that you know what type of valve you are installing, and you have it together and ready, the next step is to make sure the pipes are the right length and ready for install. You may need to cut the pipes a little more or just file them down to a clean edge. Place the valve into the copper pipes and begin to solder them together. Soldering can seem like a more advanced DIY step. Therefore, it should be practiced with safety and respect for the tools. When you learn how to solder, make sure you are following all the directions and safety precautions. They are there for a reason. You can probably use some sort of cover material when working inside the bathroom to protect your bathroom floors or shower pan for safety measures. Allow the pipes to completely cool down before you begin the next step to finish up installing your new shower valve. ​Once everything has cooled down, go ahead and replace any plastic parts into the valve. Now you will want to follow the instructions your new shower valve and faucet came with to make sure all the pieces are screwed into the right spot. Once the valve is together, you will add in any protective plate that is needed. This will secure the cover plate. This creates a security layer for the pipes much like what the drain cover is to the drain. From there, set the plate cover over the hole in the shower. This will cleanly cover the work space. Before you screw it in, use a caulk gun to add a good layer behind the plate. Caulk will keep any water from leaking or splashing behind the cover which can get into the wall and cause issues. It is okay if you have caulk that comes out from behind the plate. This can be wiped away using store-bought cleaners to give a clean and tidy look. Finish sealing the plate with the added screws. Then take the final step of screwing in the handle. ​Before you seal up anything else in the back, turn the water back on and test your work. Start by checking the faucet area to make sure no leaks are coming out around the sides. Make sure you do this step especially when you're planning to install more attachments and spa-like technology to your bathroom like a shower panel. You don't want to proceed with other renovations without getting this ​secured as it create a bigger problem later on, even if ​you're considering low pressure options for a rain shower head. Next, move to the opposite side of the wall and check the pipes you soldered. Shine a light in to make sure you can see well and watch to see if any leaks are coming through. If you see any leaks, you can simply add more soldering as needed to close the hole and then test again. Once everything looks good you can focus on clean up. Make sure you have swept or vacuumed up all the little debris and screws that would not be pleasant on bare feet. Depending on your flooring, it might better to just break out a mop designed for grout and tile flooring. You can opt to close up the open drywall access point by replacing, sanding, and repainting the area. Or, you can create an easy-to-access wall panel, so you can get into the pipes without having to recut a hole in the future. This is a good option for being able to repair any behind-the-wall leaks. Now that you know how to install shower valves, you can tackle this next level of bathroom improving and repairing DIY.